Pashupatinath Temple and cremation grounds on the Bagmati River: Here there is representation of the full cycle of life from birth to death and again. Pashupatinath is one of the most important Hindu Temples in the world. It is a temple to The Lord Shiva: God of destruction and rejuvenation, who has over a thousand forms. Pashupatinath represents the animal form he took when he became the protector and Lord of all Animals. Hindus from all over the world make pilgrimage to this site. 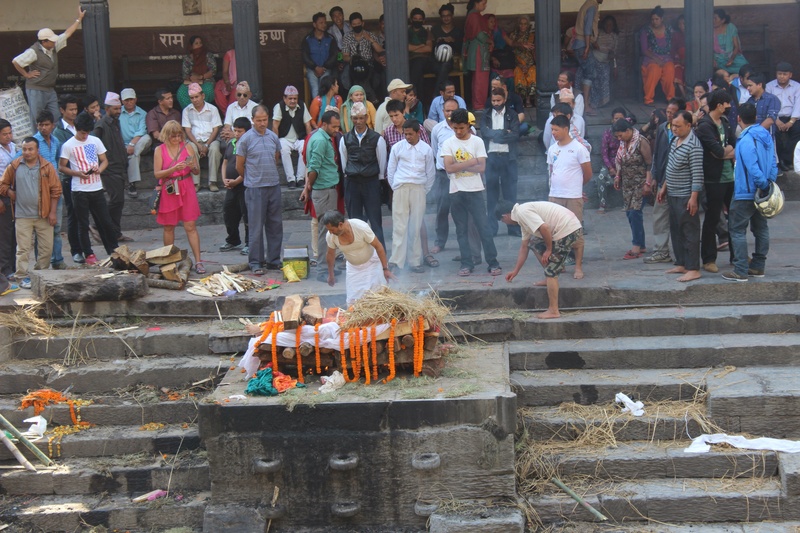 It is also the cremation grounds for the Nepalese people. When I arrived at the gate and purchased my ticket, I was greeted by a man who informed me he would be my government tour guide for a fee. I accepted. He gave me an incredible history of the place and took me all over. 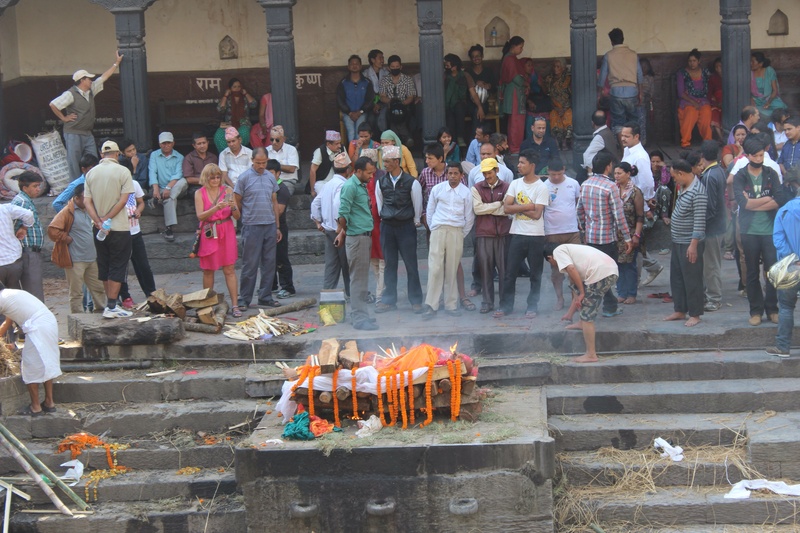 We started at the cremation platforms which are arranged according to caste. There were several bodies finishing up at the lower end and the wild dogs were scavenging for bones. This is dry season in Nepal, and in the middle of the river there were cows just hanging out. As we moved up the line, I was lucky enough to witness the preparation of the royal platform which was being prepared for the king’s sister in law. There were two bodies waiting on the side of the river as people gathered for the funerals. Traditionally speaking, the oldest son lights the first fire in the mouth of the deceased, then goes around and blesses their feet. I caught this on film. As I’m walking along the other side of the river with my guide, he suddenly turns to me and says “excuse me miss, are you marry?” Surprised I answer and he then says “Maybe you want to stop here and pray for fertility?”. I laughed and said “Thank you, no” then allowed him to tell me all about his kids. The Pashupatinath represents the full life cycle for the Hindus, and on the side of the river opposite the cremation platforms there are small pagoda looking temples that are for fertility. This is important not only for representation of the full life cycle, but because the Pashupatinath Temple is said to house the linga or phallic symbol of The Lord Shiva. The small temples sit in a row that creates a mirror image as you look through the doors. In one of the last temples, the Sadhus, or Hindu Holy Men sit. I had learned about these men in my Comparative Religions class, and was more that excited to meet them. 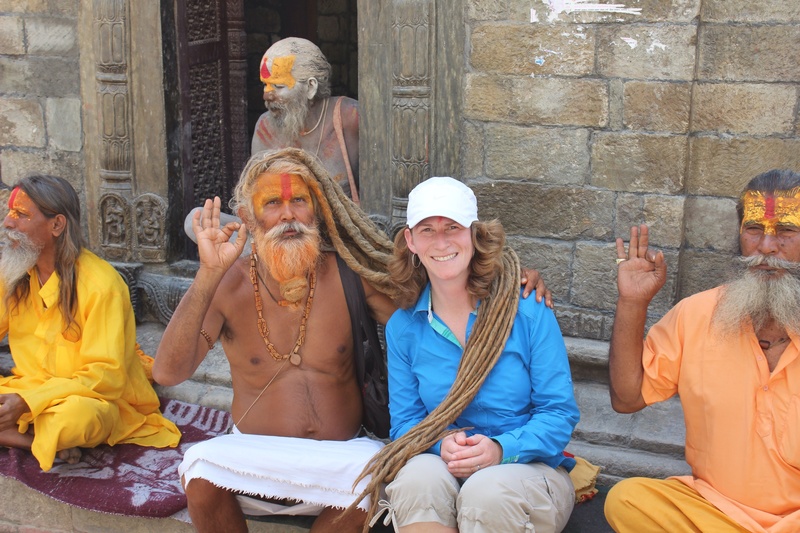 My guide did some introductions then the Sadhus invited me to sit among them. I got lots of great pictures but at one point my guide said something to one of them then told me “Move over, we make very nice picture for you.” Well, what happened next was a bit of a shocker. 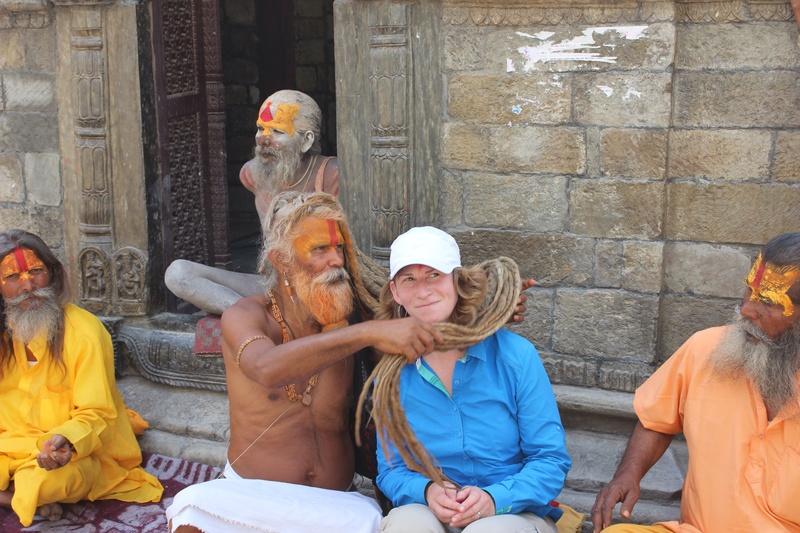 The Sadhu unrolled his dread locks that nearly touched the ground, and wrapped them around me! If you know me, you know I’m a germ freak and I was freaking out! But, I think when you look at the picture, unless you are looking very hard, you will only see a smile on my face. Truthfully speaking, you cannot be a germaphobe in travels like these…but seriously, I’d only been here for a few hours! Wouldn’t trade it for nothin’ though! My guide then took me across the river to the other side of the Pashupatinath Temple where only Hindus are allowed inside, but he took me as close as I was allowed, then he took me around the side, told me to stick my arm in the fence and said “See, now you are inside the temple!” with a big ol’ grin! …there will be more to this post later as I’m having some technical difficulties with loading pictures. Out of the frying pan and into the fire! Next up: Nepal and the Himalayas! Join me as I take up a teaching position at one of the oldest monasteries in the Khumbu (Everest) region, while living in the Sherpa community. During the day I will teach English to Buddhist Monks in exchange for being able to join them in their studies, meditation, and rituals. At night I will hike (home) to the Sherpa village where I will live with a local family. But before I go to the Himalayas, I will be in Kathmandu studying the Nepalese culture, and visiting famous Hindu and Buddhist sites while meeting holy men, and witnessing rituals that have been around for centuries! Get close-up views of the famous Monkey Temple and the Dudh (milk) Baba!